As I sit here I can barely hear myself hitting the keys on my keyboard. Beyond the window that fills one side of the room, the storm rages unabated. Leaves, branches, young avocado fruits, broken tiles and bits of plastic roofing are rushing past in an angry roar that’s filled with dust and dirt. We got the warnings days ago, it began as a yellow alert for high winds and speculation across the island was rife. “They’re calling it San Andrés”, they said. Presumably as it was being forecast to peak on the 29th November, the Eve of San Andrés, or Saint Andrew’s day and a day of celebration on the island. Then on Saturday the alert changed to red. Yesterday afternoon we removed all the plant pots from the top of the terrace wall and stashed them in corners, huddled together for protection. We dismantled the tarpaulin that acts as a tent for the dogs who usually sleep alongside the wood pile – they were being upgraded to sleeping inside. The patio table was dismantled and placed in the garden shed, the chairs stacked and wedged against the wall. The evening was ominously calm and we began to give ourselves false hope that maybe the warning was unnecessary, maybe the storm had switched direction. We’d forgotten that the phrase ‘the calm before the storm’ was rooted in reality. At midnight we went to bed and still all was calm. At 12.24am the wind came out of nowhere and ripped through the avocado tree like a nuclear blast. Gusts tore through the garden, hurling debris across the roof, deafening us with its ferocity and discharging a constant rifle fire of branches and leaves against the patio doors just feet from where we lay. The gusts raged for 20 or 35 minutes at a time before falling silent into a lull when snatches of sleep were grabbed, always tempered by the ominous knowledge that this thing wasn’t over. At around 4 am the storm moved up a gear and with it, our fear factor grew. Now branches and debris were hitting the roof constantly and the deafening roar joined forces with the rattling of the door to ensure that sleep remained a distant relative. Around 5 the storm abated to just strong winds. I could see the shadow of the avocado tree as it took on an almost rhythmic swaying against the prevailing wind. It lulled me finally into sleep. At 6.45 am an almighty crash woke me with a thump of my heart against my ribs and we were out of bed in an instant. A large branch of the avocado tree had smashed onto the roof just yards above our heads and crashed to the terrace floor in a cascade of roof tiles. By daybreak the storm had switched again to 5th gear. 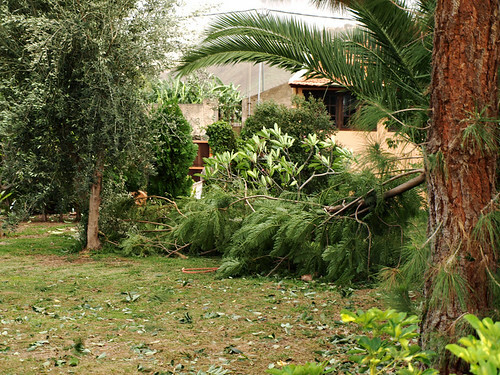 We ventured out to check the damage in our garden and in the golf course on which we live. The driving range had been torn to shreds, its flooring ripped from its fastenings and flapping in the wind. Trees had fallen all across our neighbour’s garden and across the golf course. The roof of another neighbour’s patio had been ripped from its posts and large sheets of plastic roofing were flying across the golf course. Swirling dust storms made it almost impossible to open my eyes and the wind roared harder. A bamboo fence was ripped from its anchor and flew past me, uncomfortably close. We retreated to the house from where I am now typing this. We’re in a lull right now but the red alert is in place until 3pm.